Removing attachments from an email or everything in Mail app can be useful for a variety of reasons, from ditching a file that is no longer relevant to an email thread, to lowering the file transfer size when sending/replying to a message, or for more extreme cases for individuals with smaller hard drives, for reducing the overall disk space consumed by the Mail attachments directory. 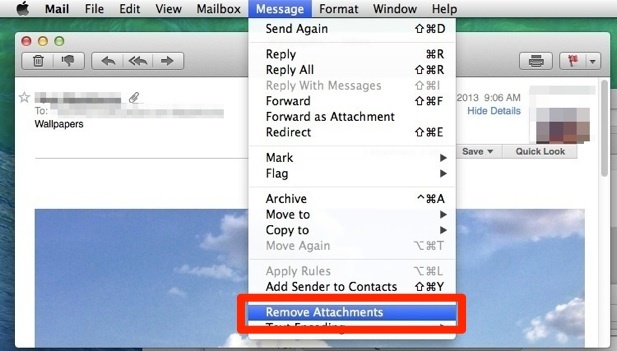 Whatever the case, use some caution when removing attachments this way, as there is no way to retrieve the mail attachment locally after they have been removed from Mail app. 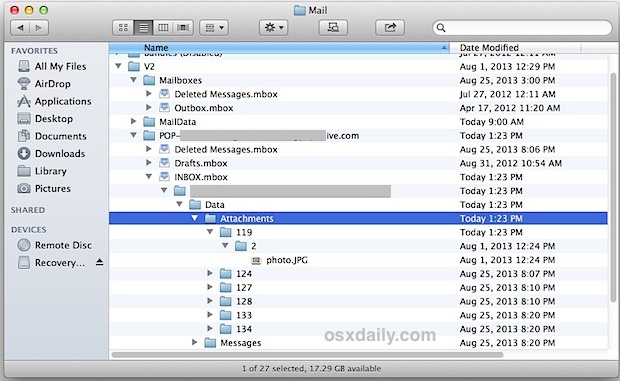 For this reason, if you intend on deleting many attachments from many emails you may want to make a manual backup of the attachment directory beforehand, which we will also cover below by showing you where the attachment files are stored in OS X. If you have Mail image previews turned off, a tiny 1kb text file called “Mail Attachment” will be bundled with the message instead, which contains the same message. This is not necessarily recommended unless you take the time to backup all of the attachments first, otherwise you may permanently lose access to the attached files. You can repeat the process for drafts, sent folder, and Trash if necessary. Based on repeated experience, it can be a good idea to rebuild the mailbox after mass deleting attachments to prevent any peculiarities with Mail app. You can manually back up this entire directory if necessary by copying it over to an external drive or elsewhere on the Mac. Within that Attachments subdirectory will be even more subdirectories, labeled randomly as numbers, containing additional subdirectories with the attachment files themselves. Yes, the directory structure seems unnecessarily complicated. Because of the complex directory structure, it’s often easiest to just copy or backup the entire ~/Library/Mail/V2/ directory rather than looking around for individual files. Going that route also makes it easier to restore the attachments to Mail app, because all that is required is dragging/copying the entire V2 directory back into the ~/Library/Mail/ directory. Whether or not it’s necessary to backup and delete the Mail attachments folder is ultimately up to you, but if you find that it’s taking up a lot of disk space by scanning a drive with an app like OmniDiskSweeper, it may be a worthwhile endeavor for those with very limited disk space. On MacSierra new Mail version, I see “remove attachments” as light grey color (inactive) and can’t remove any attachment form a single email message, is that an issue i should fix and how?